Exposure: 10 x 480 sec H-Alpha (1x1), 6 x 180 sec RGB Exposures (2x2). Processing: Images were captured with Artemis Capture (as FITs). Aligned/stacked and dark subtracted in Astroart with Sigma Combine. H-Alpha and Color channels were scaled and color balanced in Astroart. Channels were co-registered in Astroart. Luminance construction consisted of the H-Alpha exposure. Curves and Levels applied in Photoshop to the Luminance construction to optimize object features. A light background noise reduction was applied to the Luminance construction. Final LRGB combine was done in Photoshop using Luminance Layering in LAB color Space. 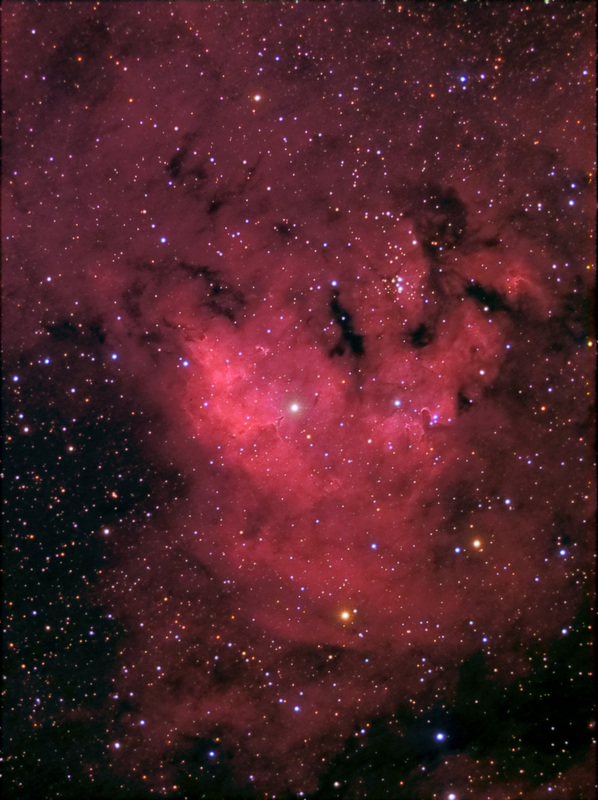 Color balance (more red) was applied to nebulosity at low signal levels (where there was luminance data but little to no color data). Final mosaic combine was done in Photoshop. A light sharpening was applied to the final image. Final Image size is approximately 1392 x 1040. North is up in this image. This is a hydrogen emission complex more commonly known as Cederblad 214 but it is also catalogued by Sharpless in his catalog as Sh2-171. This field is located on the border of constellations Cepheus and Cassiopeia. The central star energizing the hydrogen emission is a 5.7 apparent magnitude star. This image replaces an earlier image that can be seen in the Archives here . The Vertical FOV is 107'. Image center is located approximately - Equatorial 2000: RA: 00h 04m 42s Dec: +67°09'59"